The Catsbury Park Cat Café is organizing and hosting the Catsbury Park Cat Convention. 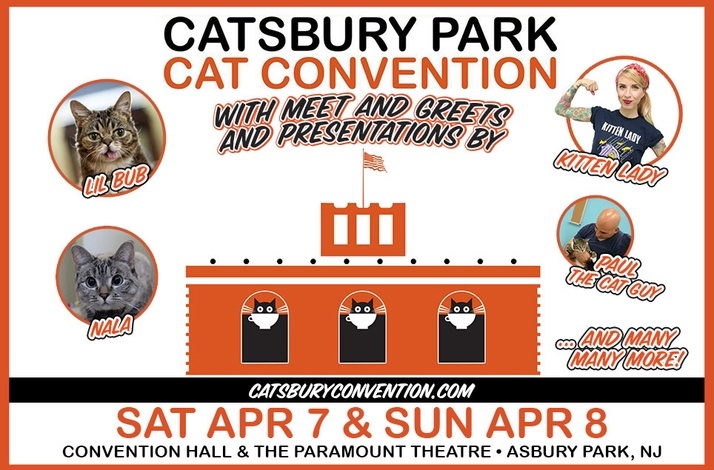 They intend to make this event the East Coast’s Premiere Cat Convention, bringing lovers of all things feline to the historic Asbury Park Boardwalk. This two day event will be held on Saturday April 7th and Sunday April 8th, 2018 at the Convention Hall and Paramount Theatre in Asbury Park, New Jersey. General admission tickets to the event will grant you access to Convention Hall, which will have scores of vendors, events and activities throughout the day such as Cat Trivia, Cat Bingo, DJs, a tattoo booth set up to get Cat related tattoos, face painting, a Cat art show and many more fun Cat related games and activities. It does NOT include access to Meet and Greets or select presentations. Tickets for Meet & Greets and select presentations must be purchased separately. Jersey Shore Animal Foundation is proud to be one of the vendors as well has showcasing some of our adoptable cats and kittens. More information about which of our furry friends will be in attendance will be announced as we get closer to the convention.